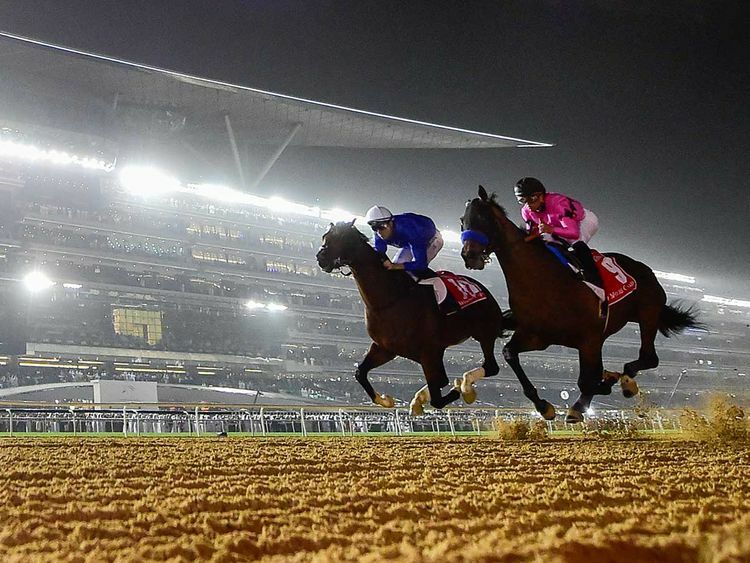 Dubai: All good things much come to an end and this Friday the curtains will fall on the 2018-2019 UAE racing season when Meydan Racecourse hosts the final meeting highlighted by the inaugural running of the Nad Al Sheba Classic, sponsored by Longines V H P Collection. A 2,000-metre rated conditions event on turf, the race demonstrates the depth and attractiveness of horse racing in the country with a maximum field of 16 runners lining up to to challenge for a purse of Dh240,000. Among them are UAE debutant Gabr, who races out of the Doug Watson stables and Mike de Kock’s Yulong Prince, a Grade 1 winner in South Africa, who was last seen finishing 10th behind Japanese superstar Almond Eye in the $6 million Dubai Turf (G1) on Dubai World Cup night. Owned by Shaikh Hamdan Bin Rashid Al Maktoum, Deputy Ruler of Dubai and Minister of Finance, the four-year-old Intello colt was a two-time winner in Britain when previously trained by Sir Michael Stoute. On his last UK start Gabr finished a noteworthy third in the Group 3 Darley Stakes at Newmarket, having previously won the Listed Foundation Stakes at Goodwood in September. Watson, who has reasonably high ambitions for his trainee, commented: “He was a bit late coming in, but is a really nice new horse in the yard. De Kock saddles four of the 16 including Yulong Prince, Majestic Mambo, Yakeen and Royal Crusade all of whom have raced in the UAE this season. Another interesting contender is the Rashed Bouresly-owned and trained Ajwad, who was a hugely impressive winner of his last Meydan start over 1,400 metres. However, he will need to cope with the extra 600 metres of today’s race. Erwan Charpy saddles both Blue Sovereign, a maiden after just four starts, and Logrado, a 2,000-metre dirt Grade 1 winner in his native Argentina, who contested the Group 1 Al Maktoum Challenge Round 3 and Group 2 Godolphin Mile. All seven races are sponsored by Meydan’s Pillar Partners, including Gulf News, Longines, Al Tayer Motors and Azizi. The main support race is the Meydan Mile, sponsored by Azizi Riviera, for which eight have been declared, including the Watson duo Thegreatcollection and Galvanize. Frenchman Erwan Charpy is also doubly represented with Silver Look and Moqarrar, who made a winning dirt debut when landing a handicap over this course and distance in January. Satish Seemar also saddles two runners with stable jockey Richard Mullen on Bochart and champion-elect Tadhg O’Shea partnering Ode to Autumn. ■ 125 jockeys were seen in action during the 2018-2019 UAE Racing Season. As many as 47 of them recorded at least one winner.